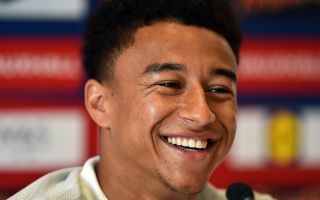 Jesse Lingard has been busy comparing abs with Cristiano Ronaldo after the latter’s celebration following his goal for Juventus against Man Utd on Wednesday night. It was ultimately all in vain from the Portuguese superstar, as the Turin giants fell to a 2-1 defeat to the Red Devils after a dramatic late turnaround. Nevertheless, it was a stunning goal from Ronaldo, as seen in the video below, and his celebration certainly captured plenty of attention too as he seemingly wanted everyone to appreciate the work that goes in to keeping himself in prime physical condition. However, Lingard has posed a not-so-serious question on Instagram, as seen in his post below, where he appears to have spent his Thursday morning putting together a comparison photo of his abs up against those of Ronaldo. “Who did it better?” he asks in his caption, clearly revelling in the fact that he can afford to poke fun at the Juve superstar’s celebration after his side managed to come away with all three points. Lingard did receive a slight backlash though, with a couple of comments on his feed attacking the fact that Ronaldo has achieved much, much more in his career and so perhaps he did indeed do it better.